I used my mobile phone to listen to 90.5MHz FM channel and confirm that there was indeed a working FM channel at that. Actually, there has to be multiple channels in this band. 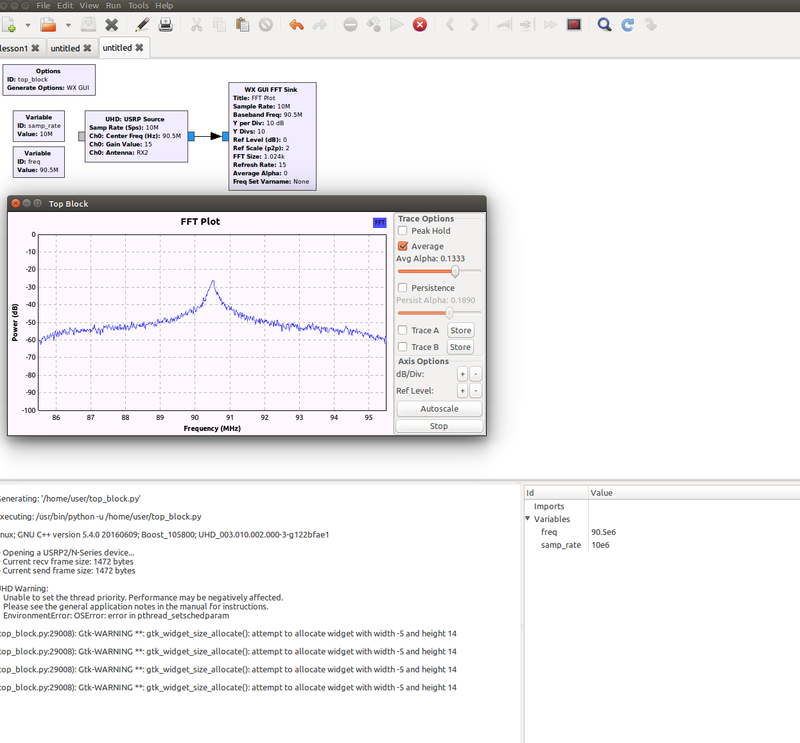 In many FM radio examples, it is possible to observe multiple bands of FM channels. Unfortunately for me, I cannot see a single one. 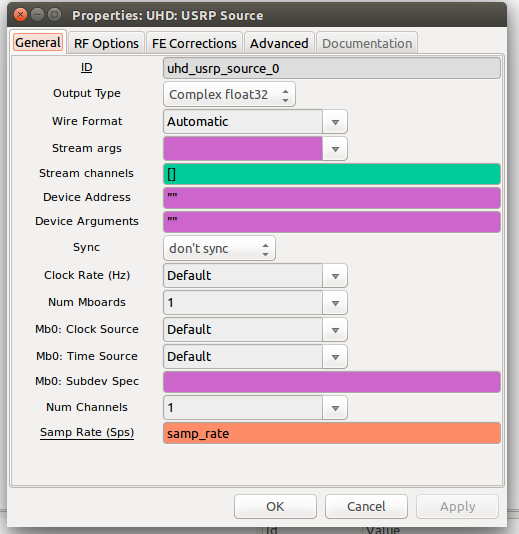 I feel that there is something wrong with my setting in GNU radio. I post the settings I have applied to each box below. As Marcus Müller has requested I ran the command to find the daughter board I am using. My output is stated below. 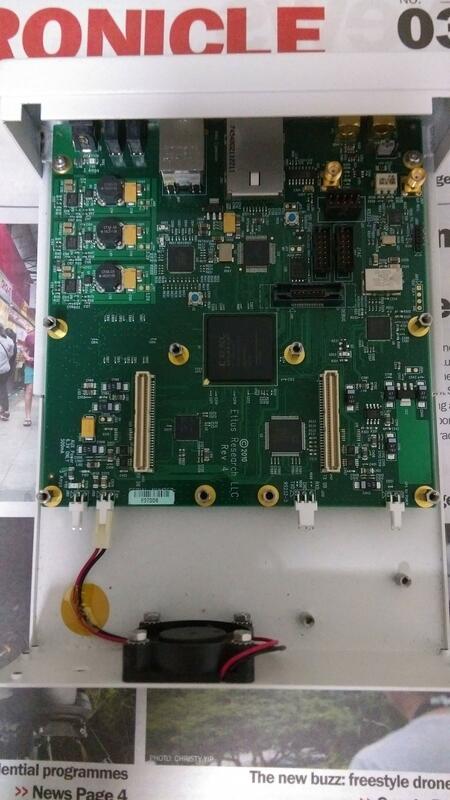 To support Marcus's second answer, I post an image of the inside of my USRP N210 below. It would be really great if my mistake can be spotted. this is typically the symptom of a not properly connected daughterboard, or one with broken power rails; less often, sign of a corrupted daughterboard eeprom. Please try to take out and plug back in your daughterboard (you still haven't told us which daughterboard model you're using! ), and try again. The antenna I tried earlier was a 868MHz antenna. So, no chance you get good reception at 90 MHz, then, right? I don't see anything wrong with your basic GNU Radio flow graph, so it is likely a hardware configuration issue. In my experience, the most common software reason for getting no visible signal is incorrect gain settings. Is 15 dB an appropriate middle-of-the-road setting or is it too low or too high? I don't know what the minimum and maximum supported by the hardware are, but the FFT plot looks more like an overload than below-the-noise-floor, so try reducing it. In extreme cases, such as if you live near a broadcast station, you might even need an external attenuator. You have selected antenna port RX2. Is your antenna actually plugged into that port, or a different one? This happens more often than one would think: Are you sure your antenna is suited for the band? I've talked to way too many people that complained about bad reception, then to proceed to show they were using a 2.4 GHz antenna for 433 MHz. If you really see nothing but this ca 0.005 amplitude peak in the middle, I'd argue you've got LO leakage. However, you have a very wide "hill" around that, as if lots of interference gets mixed down there. That is strange. Not the answer you're looking for? 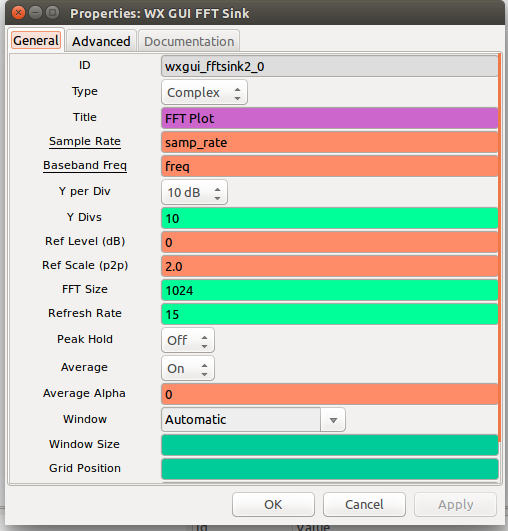 Browse other questions tagged software-defined-radio gnuradio usrp or ask your own question. USRP: Are RX and TX on the same or different channel for single daughterboard? 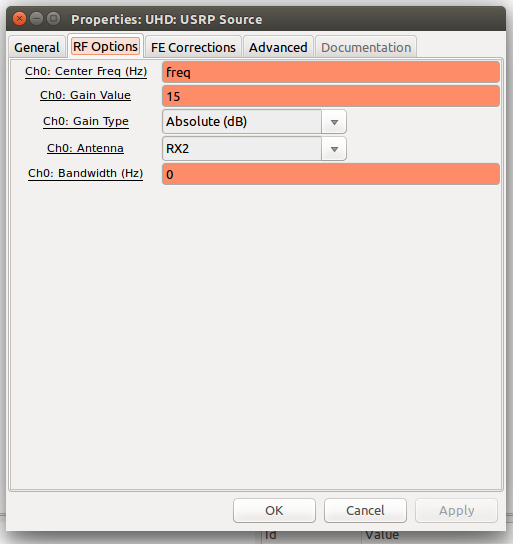 How can I make WBFM receiver without using WBFM Receive block?